I guess I have been running behind schedule all day. Here is the post of my same red Ken Done scarf 'p.m. style' from today. Out to dinner with Smart Ladies. And here is the equation of 'a give' that I most want to share, best exemplified by this red scarf: Ken Done creates the logo for Canteen (charity working with young people with experience of cancer) = 1st give. 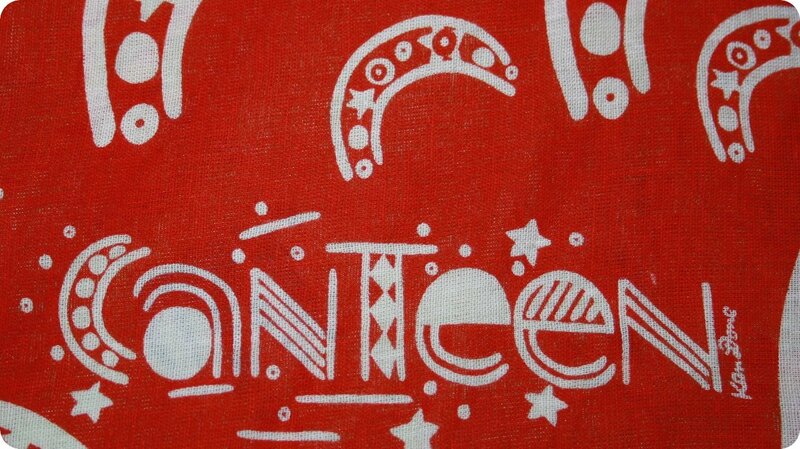 Canteen produces scarf for people to buy to support organisation. Random person buys Canteen scarf, thereby raising money for Canteen = 2nd give. Random person after period of time gives scarf to op-shop = 3rd give (instead of throwing away). I go into op-shop and buy scarf, thereby supporting the op-shop and its charity arm = 4th give. 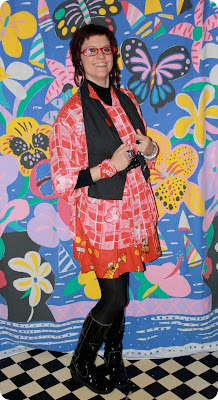 I then wear the scarf for a blog that raises money for The Social Studio = 5th give. etc. etc. etc. And I haven't even got yet to the 'give' in the *pleasure* involved in wearing the scarf! What do you reckon are the best op shops. You seem to be quite the expert. The equation on 'giving' is an excellent one Jackie - a simple message delivered effectively and practically - I do hope many more people get to hear your message!